Paper 11- 0n·Line Student Interaction for Learning Physical Chemistry. Book Review 1- ''The Road Ahead, "
Submissions: General articles should be sent to editor Brian Pankuch at the above address. WE would appreciate both 1) printed copy ( hardcopy) and 2) a readable file on a Macintosh or IBM compatible 3 1/2" diskette. We have fewer problems with 31/2 'diskettes. Email submissions are requently lost, and formatting and special characters are changed. Submission deadlines: Fall issue - Sept. 25; Spring issue - March 15. ALL NEW AND RENEWAL SUBSCRIPTIONS: PLEASE SEND REMITTANCE TO CCE Newsletter, c/o Donald Rosenthal, Department of Chemistry, Clarkson University, Potsdam, NY 13699-5810. RATES: USA 1 year $2.50. two years $4.50: Other countries 1 yr $5, two yr $9. Please make a check or money order payable in US funds to Computers in Chemical Education Newsletter. One to three issues are published per year. Consulting Editor Donald Rosenthal, Department of Chemistry, Clarkson University, Potsdam, NY 13699. Send meeting notices, etc., to Don, ROSEN@CLVM.Ciarkson .edu. Managing Editor Henry R. Derr, Laramie County Community College, Cheyenne, WY 82007 HOERR@ eagles .Icc. whecn .EDU. F. Holding open meetings at the biennial BCCE meetings. These activities will be described in this message and elsewhere in this Newsletter. A symposium on "The Use of Computers in Introductory Chemistry" is being organized by Harry Pence (SUNY at Oneonta, pencehe@snyoneva.cc.oneonta.edu). Harry Pence is organizing a symposium on the use of simulation in teaching chemistry for the fall 1996 ACS meeting in Orlando,. FL (August 18 to 22). Yuzhuo Li (Clarkson University, yuzholi@cadvax.clarkson.edu) will organize a symposium on the "Use of Research Grade Computational Chemistry Packages in Undergraduate Chemistry Courses" for the fall 1997 ACS meeting in Las Vegas, NV. If you have suggestions for symposium topics or chairs for future ACS symposia, please send them to me. An on-line symposium entitled"New Initiatives in Chemical Education" will be held June 1 to July 19, 1996 (see the announcement elsewhere in this issue). 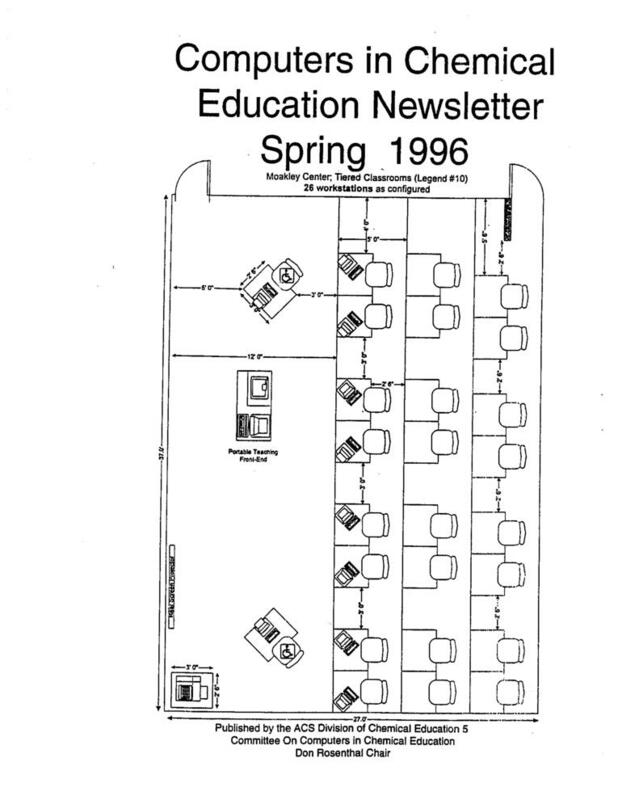 A symposium entitled "General Papers in Chemical Education" is planned for the summer and fall of 1997 and during the winter and spring of 1998. (see the article in this Newsletter). Marco Molinaro (UC at Berkley, molinaro@ cchem.berkley. edu)andCharles B. Adams (MeG iII U n ive rs ity, Abrams @omc.lan.mcgill.ca) will organize a symposium on "Computer-Aided lmmersive Learning Experiences" for the fall1997 ACS meeting at Las Vegas, NV. Other on-line conferences and symposia are in early stages of planning. Suggestions may be sent to me. The CCCE is sponsoring Workshops just before the BCCE at Clemson. Further details are provided in an announcement elsewhere in this Newsletter. This Newsletter is currently being published twice a year. Articles which are submitted and accepted will appear in a timely manner. We are anxious to receive articles from readers. An open meeting of the CCCE is planned for the BCCE at Clemson. This will provide an opportunity for you to meet members of the committee -to learn what we are doing to provide ideas and suggestions and to ask questions. Future symposia, on-line meetings and courses will be discussed. If you plan to attend the BCCE, please attend our meeting. The names and affiliations of the twenty-two members of the CCCE are provided below. computer area to help decide. and ideas also surfaced as related below. spiral in cost and make it much easier to use. allow breaking of current encryption schemes in seconds. The authors are nervous for good reason. and others in potentially dangerous, litigious situations. know when someone else is recording-no thanks. subject area material as on a test. use of specific packages and the results of using them. Union of Concerned Scientists (I'm a member of UCS). followed for contacting Representatives or the President. current is a big advantage. to the UCS homepage at http:\\www.ucsusa.org. protector itself is guaranteed for as long as you own it. which allows the next surge to come right on through.